On our previous issue, we have discussed regulations of the pet food industry and introduced the elements of pet food packaging which includes Best Before Date and what it really means; Display Panel that faces the aisle for you to see; and the Information Panel located in not-so-obvious places on the side or back of the package. For this month’s issue, let’s take a closer look at the truth behind the words used by pet food manufacturers to convince you that their product is what’s best for your pet. We will explore the real deal behind the ‘complete and balanced diet’ – a much-used term in the pet food industry. What do you envision for your pet’s health when you see the word ‘complete and balanced diet’? 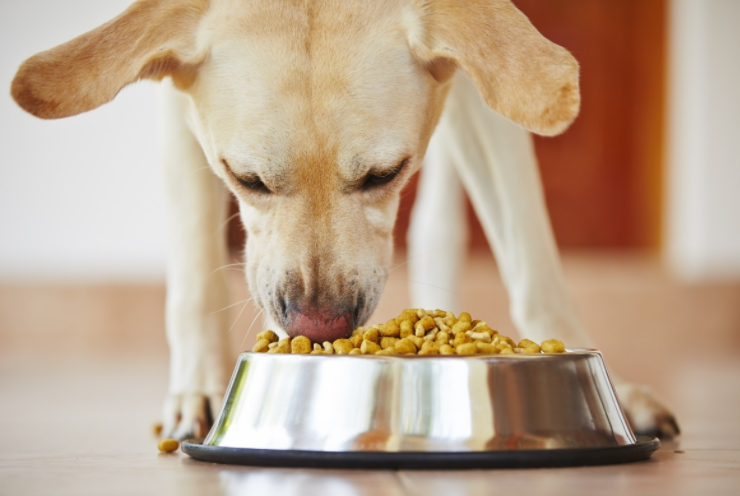 Many consumers would feel comfortable purchasing pet food products labelled as ‘complete and balanced diet’, thinking they’re making the right choice. The Association of American Feed Control Officers (AAFCO) regulates the words that manufacturers can use to name and describe certain ingredients and food benefits. The food is “nutritionally similar” to another member of an AAFCO approved product family. Let’s analyze each criteria individually and learn more about manufacturing practices related to the pet food industry. 1. Proper amount of nutrients for all life stages. AAFCO requires ingredients to be listed in descending order before processing. Ingredients and nutrient requirements are not required to be linked to life stage. And in spite of the label ‘all life stages’, some nutrient requirements may not be sufficient to meet a critical life stage for your pet (e.g. puppy or senior). Similarly, percent content is required only for the macro ingredients (protein, fat, carbohydrates). Not all ingredients are listed and may be bio-available to your pet. Ingredients list generally do not consider breed-specific digestibility, regardless of what the food is named. Food labeled as breed-specific is about marketing rather than nutritional needs. For example the name ‘Prescription Diet’is a trademark related to marketing but has no relationship to therapeutic, medicinal or nutritional value. Some ingredients (e.g. meat) may be wet when added and most of the moisture is removed during processing. Whole chicken, beef or lamb listed as the first ingredient on many dog food labels, may represent up to 78% of the food content by weight and may be reduced to 10% after processing. Rice is dry when added and is often listed after meat (chicken, lamb or beef) in the ingredients list. However, after processing, it changes and in reality, can be greater than meat by weight. This means that a food labeled as ‘chicken and rice’ may actually contain more rice than chicken. If the meat ingredient is listed as meal (e.g. chicken meal, lamb meal, beef meal, fish meal), the moisture has been removed before processing and the actual weight and order of occurrence is more accurate. AAFCO requires that eight dogs undergo feed trials for a period of 26 consecutive months. During the trial period, up to 20% of the animals can be removed for any reason without explanation. When the animals are removed, the feed trial continues uninterrupted. The remaining six animals in the study must retain 15% of their body weight and blood chemistry to meet the criteria for approval. However, weight gain is not considered and the animals can gain more than 15% of their body weight during the trial. Since weight gain is not a required criterion under AAFCO rules, it does not have to be reported. Meanwhile, blood chemistry must not decline more than 15%. Test feeding six to eight dogs, over a period of 26 weeks, without a control group for comparison does not even come close to providing a scientifically valid sample size or test period to accurately assess … ANYTHING. Manufacturers are allowed to group foods that they claim to be ‘nutritionally similar’ into families of foods. It allows them to bypass any AAFCO feed testing. They only need to prove that the ingredients of the newly-produced item are within the range of a previously tested food. 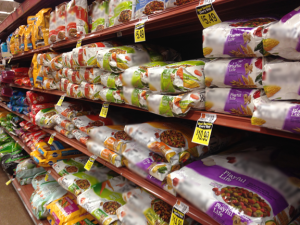 The process of ‘grouping’ is the most cost-efficient approach for pet food manufacturers to bring budget priced foods to market, under their flagship name but with a different sub-title. Pet food labels can be tricky and misleading so don’t be fooled! For our next issue, we will provide a more detailed explanation of the ingredients list and what it really means to the quality of your pet food.